We have seen some cool stuff made from recycled VHS tapes, like the VHS USB Drive, now you can have your very own lamp made from recycled VHS tapes. The VHS Lamp is made from 7 recycled VHS tapes, and the lamp measures 4″ x $” x 27″ tall, an ideal addition to your geeky apartment. The The VHS Lamp can only be used with CFL (compact fluorescent) bulbs, as anything stronger might melt the tapes. 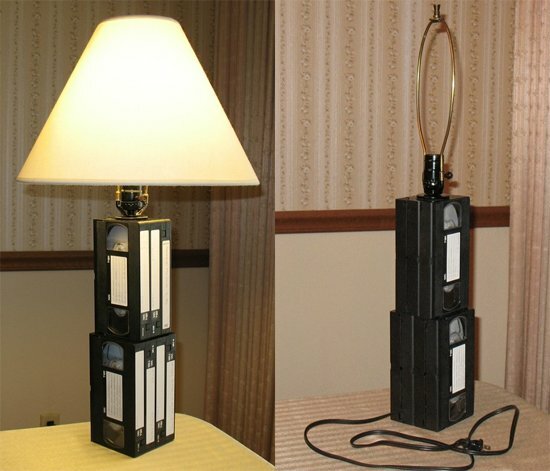 If you want one of these fun VHS lamps, they are available for $60 from Etsy.